Born on July 27, 1907 at Kodijärve, Province of Võrumaa in Estonia. Studied art at Art Academy “Pallas” in Tartu, Estonia (1929-1932). After Pallas worked in the Editorial Department of “Vaba Maa” (“Free Country”). Went to Finland in 1943 and in 1951 immigrated to Canada. 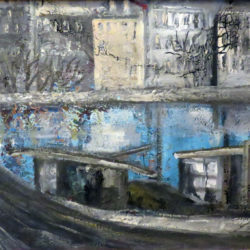 In Toronto he improved his artistic skills at the Ontario College of Art 1959-60 and in 1964 studied glazing techniques in painting in Paris, France. Worked in Canada at the Estonian newspapers as a photographer and also wrote articles both for Estonian newspapers in Canada and U.S.A. – mainly art reviews. Member of EKKT since 1963. Worked mainly in compositions and landscapes. Participated in several one-man shows and group exhibitions. Articles in numerous catalogues, newspapers, magazines, EKKT 1955-1966 Art Album. Works in private collections in many countries. Died in Toronto on October 29, 1976.